April is marked by a fantastic show of purple-pink from countless redbuds in our woods, fence rows and yards. 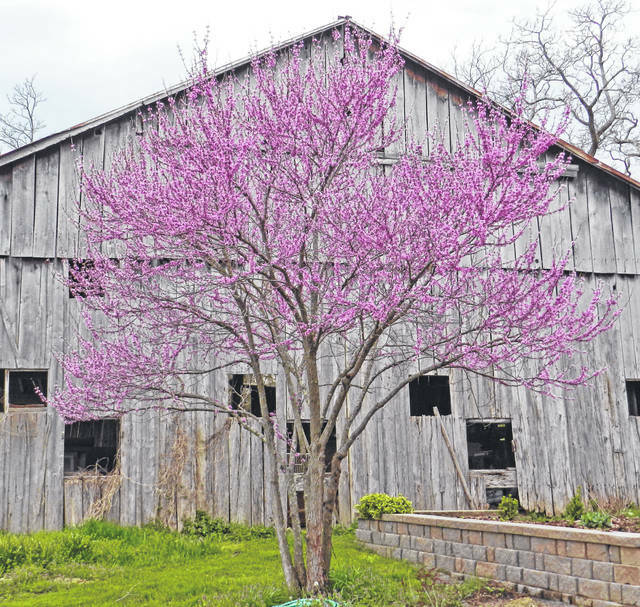 Gardeners naturally want these colorful trees in their landscapes, but redbuds are a real challenge to transplant, and they need special pruning to ever develop into shapely landscape specimens. Eastern Redbud (Cercis canadensis is their proper botanical name) are native to this area, and they grow wild along our roadways and the edges of fields. They are very tolerant of poor clay soils, deer don’t bother them, and they even thrive in the juglone-poisoned soil under walnut trees. Their plentiful bean pods are scattered far and wide by wildlife, so they come up from seed wherever there’s enough sun. Unfortunately, redbuds don’t naturally grow in attractive shapes. They like to sucker very unevenly and become one-sided. Older trees tend to split and break because they form U-shaped crotches, or “wishbones”, at an early age. These bark-included crotches are a structural weakness that can only be prevented by careful pruning when the trees are young. Redbuds tend to droop and sag, so unless their lower limbs are cut off when young they become large shrubs instead of trees. They have fragile, thin bark, so damage from mowers and weed-eaters often causes disease and shortens their already short life span. Older redbuds are vulnerable to pests and disease. 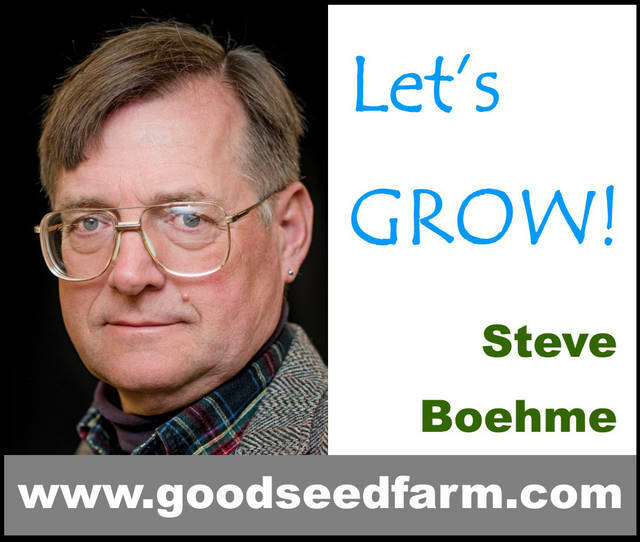 The good news is that it’s easy to restore tired, broken old redbuds to shapely good health, using a technique we call the “bush-hog approach”. We have a really nice, shapely redbud in our garden that is a great example of how easy this is. This particular tree (see photo) was a leftover “runt” in our tree nursery, an ugly duckling no one wanted, and it died back during a summer drought. We cut it off at the ground and transplanted the roots into our landscape. The following year, multiple suckers grew up from the ground. We cut off the ones that were sagging or growing sideways, saving just five healthy upright canes. As the tree grew we continued to cut off any sideways-growing branches, “limbing up” the clump-form tree until the trunks were tall enough for us to walk under their lowest branches. The result was a classic “vase” shape. Every year we have to thin the lowest branches for clearance, but in a few years our cutoff stump was transformed into a beautiful multi-trunk specimen. Redbuds grow up to 30 feet tall, with a spread of 30 feet, given sufficient space. This means that you should allow 30 feet for a redbud tree and not plant it closer than 15 feet from a building. Established redbuds tolerate drought, but they do best in areas that are somewhat moist. Nurseries have introduced hybrid redbuds with maroon foliage, like “Forest Pansy”, and weeping redbuds like “Lavender Twist”. There are white-flowered varieties, and redbuds with darker purple or red blooms. These exotic varieties tend to be even more short-lived than the native redbud, which typically only live 30 years or less. Redbuds really don’t like to be dug up and moved, and don’t like their roots disturbed, so planting young examples is the safest approach. Sapling redbuds tend to be lopsided and spindly. It may sound scary and cruel, but our “bush hog” method is the best way to get a shapely tree. Let the young transplant get established, then cut it to the ground and make it regrow in a five or seven trunk clump. Did you know that this method is how nurseries produce shapely multi-trunk birch tree clumps? It’s true. Tough love for trees.